Durable bag with eco-friendly features. My companies logo came out great on the center of these bags. Thank you Custom Earth Promos. My company has been rolling with Custom Earth Promos for some time now. We've purchased many products from them and never had any complaints. Phenomenal product. Custom Earth Promos was very good at assisting me over the phone to the proper product that would suit my companies needs. Great job CEP. A friend of mine recommended me checking out Custom Earth Promos for my business and I thank her and you guys gratefully. The products including these eco drawstring bags are sensational yet affordable for all. 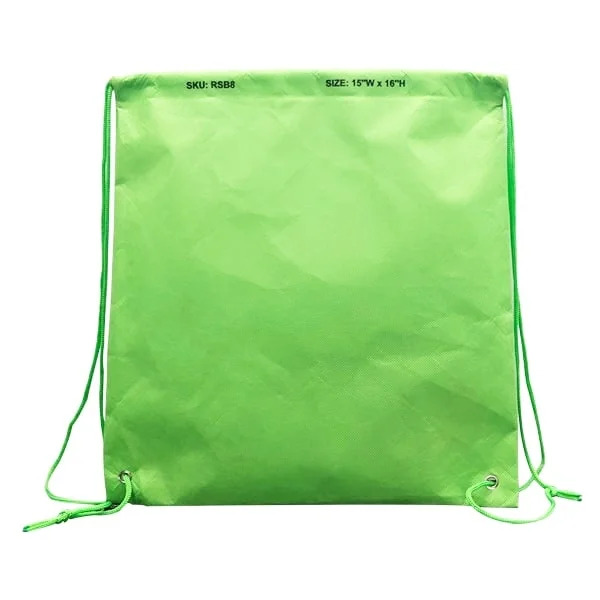 Full color imprint on these eco drawstring bags. I was able to customize the bags just the way I'd hoped. Thank you Custom Earth Promos for everything you have to offer. One of a kind and stylish bag. Bought these in a 5k bulk order for my business and they went over really well at my convention. Thanks for the help. The color selection you guys had to offer made the ordering process a lot more enjoyable. Choosing from all the colors with our companies logo was great. Thanks. The artwork you guys added for us came out wonderful. Love these drawstring bags. Thank you so much Custom Earth Promos. Purchased these bags in a bulk order for my business and couldn't be any happier with the outcome. I'm going to refer your company to all friends and family. Customizable Options, like Reinforced Closures! 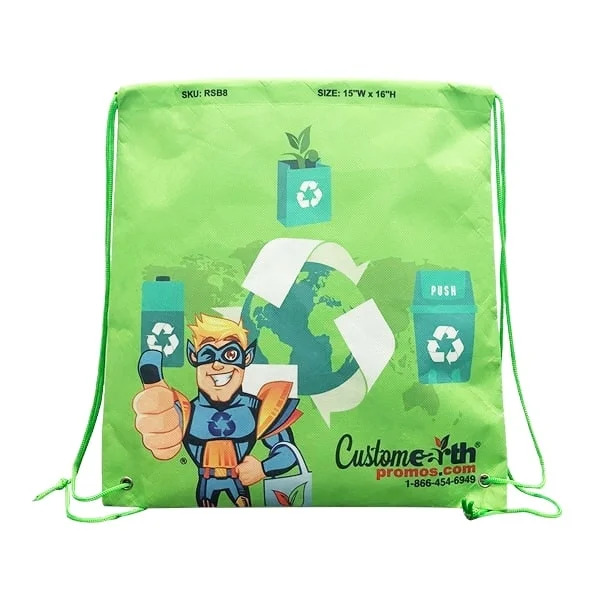 Your company needs a new promotional item, and why not go for our newest recycled, sublimated bags? You’ll get all you need in a promo bag and more with the Promotional Sublimated Eco- Drawstring! Made with durable materials as well as eco-enforced lamination make this tote a great parting gift for eager clients at trade shows! Make sure they carry it with them to the grocery store, to school or to an overnight stay! You can have your personalized eco-tote ready and to you sooner than most, with a three week turnaround available for rush orders. The reliability of the bags make them everlasting gifts and a perfect one for your potential eco-market! Personalize it with everything you need in a marketing item, from reinforced handling to closures that highlight an attention to detail only you can pull off! Make a name for yourself at your next promotional convention by giving out sturdy drawstring that is sure to dazzle! Cover the bag front and back with your best company image, and watch your business bloom. The cotton handles give the bag a strong feel, guaranteeing you leave your items in a sturdy bag! The 15" W X 16" H imprint area really brings this bag home with customers; you get to plaster your name where everyone can see all the time! Make sure you get the most out of our customer service personnel, as well as our design team, to make a bag you can be proud of! You can work with online with our virtual spec platform to personalize your vision and customize, even add extra pockets or enclosures! Let us provide you with the tools you need to push your brand forward. Imprinting is made easy at Custom Earth Promos, you won’t regret it!